The best King’s Day parties are in Amsterdam. Over 1 million people take to the streets. Dressed up in orange, they party for 2 days and nights. 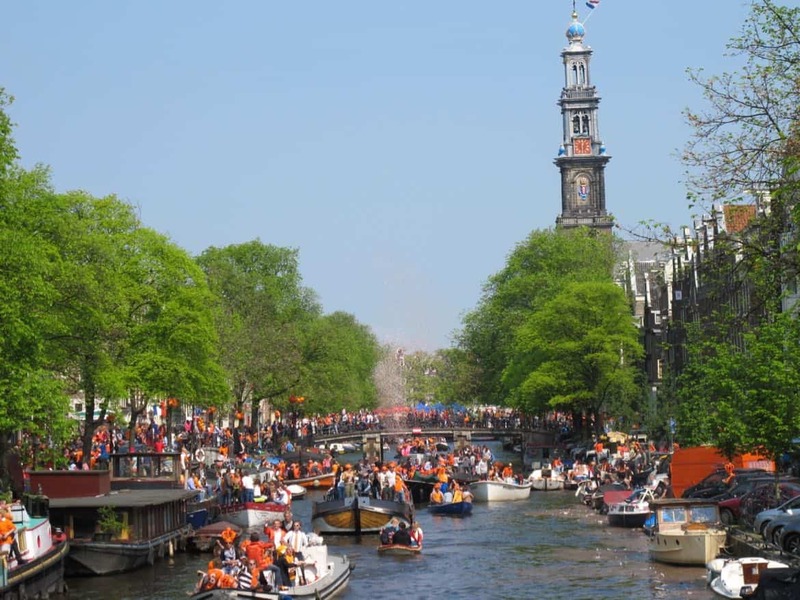 King’s Day in Amsterdam is celebrated every year on 27 April. Everywhere in The Netherlands, the birthday of King of The Netherlands, Willem-Alexander, and the monarchy in general, is celebrated with an orange craze, parties, games and events. King’s Day is a national holiday of The Netherlands. In Amsterdam, King’s Day is best known for its free open air market. The entire city become one big flea market as people take out their old rubbish and try to sell it. Everywhere you walk, the streets are lined with people selling clothes, house ware, books and records and home made pies and other food. The fun is not so much in making money, but more in the activity and chatting with everyone. The city centre is extremely packed with people, so if you don’t care for crowds, avoid the area around Leidseplein and Rembrandtplein. The more the day advanced, the more people will be drunk! Best areas to walk around to get a feeling of the mood are the Canal Belt (Singel, Herengracht, Keizersgracht and Prinsengracht) and the Jordaan Quarter. For a little more peace, head into the Vondelpark or the NDSM in Amsterdam Noord, where the children rule the market stalls. Children are also happy to take out their musical instrument, show their dancing skills or do some gymnastics, hoping to earn some small money. Orange crazy Dutch people celebrate King’s Day in Amsterdam. Legendary travel company Stoke Travel have set up an all inclusive experience for you to celebrate King’s Day properly. Travel, accommodation, and guides to the best parties are all part of the deal! The next day, 27 April 2019, it’s King’ Day in Amsterdam. People from all over The Netherlands come to the capital city, most by train, to party. The people dress up in orange and drink and dance during a one-day-long street party. The Jordaan Quarter celebrates the monarchy, Amsterdam 2011. Traditional Dutch cakes for King’s day. Get a new bag for a bargain on Amsterdam’s King’s Day Festival. Hi, we are thinking of hiring a boat for the day on Queens Day 2012 for around 30 people and would need a skipper to drive the boat. I am new to Europe and I am currently living in Barcelona. However, I would love to attend the King’s day in Amsterday. However, I have no idea how to get there and would also love to know if I can go with someone organises it, so I dont end up alone.